Last season's Johnstone's Paint Trophy finalists Carlisle came from 2-0 down to beat Port Vale on penalties. Oliver Norwood looped a header into his own net to give Vale the lead before Marc Richards nodded in a second. Two goals in five minutes got the hosts on level terms as James Chester headed home and Jason Price steered into the bottom corner to force spot kicks. Craig Curran missed the first kick for the hosts but keeper Adam Collin saved two to leave Frank Simek to win it. 95:02 Penalty scored by Frank Simek. Carlisle 4-3 Port Vale on penalties. 94:31 A save by Adam Collin from penalty by Louis Dodds. 93:54 Matthew Robson scores a penalty. Carlisle 3-3 Port Vale on penalties. 93:21 Placed penalty taken by Tommy Fraser saved by Adam Collin. 92:47 James Berrett scores a penalty. Carlisle 2-3 Port Vale on penalties. 92:14 Justin Richards scores a penalty. Carlisle 1-3 Port Vale on penalties. 91:47 Kevan Hurst scores a penalty. Carlisle 1-2 Port Vale on penalties. 91:18 Gary Roberts scores a penalty. Carlisle 0-2 Port Vale on penalties. 90:37 Placed penalty taken by Craig Curran saved by Chris Martin. 90:01 Marc Richards scores a penalty. Carlisle 0-1 Port Vale on penalties. 90:00+7:55 The penalty shoot-out is about to start. 90:00+3:37 It's full-time and the rules of the competition mean we go straight to a penalty shoot-out. 90:00+1:53 Craig Curran produces a drilled right-footed shot from 20 yards. Save made by Chris Martin. Outswinging corner taken from the right by-line by Kevan Hurst. 90:00+0:49 Unfair challenge on Peter Murphy by Marc Richards results in a free kick. Free kick crossed by Matthew Robson, Kris Taylor manages to make a clearance. 90:00+0:49 Substitution Tommy Fraser on for Sean Rigg. 90:00+0:08 Shot by Matthew Robson from outside the area goes high over the crossbar. 89:12 Free kick awarded for a foul by Peter Murphy on Robert Taylor. Gary Roberts produces a strike on goal direct from the free kick, save made by Adam Collin. 89:12 Substitution (Port Vale) makes a substitution, with Gary Roberts coming on for Doug Loft. 88:14 Sean McDaid produces a cross, Lee Collins manages to make a clearance. 88:04 Jason Price sends in a cross, Lee Collins makes a clearance. 86:14 Foul by Lee Collins on Jason Price, free kick awarded. Free kick crossed right-footed by James Berrett from right wing. 85:23 The ball is crossed by Frank Simek. James Berrett produces a right-footed shot from just outside the box that misses to the right of the target. 82:16 Jason Price has a drilled shot. Chris Martin makes a save. Corner taken right-footed by Peter Murphy, Header by James Chester from deep inside the penalty area misses to the left of the target. 80:42 The assist for the goal came from Frank Simek. 80:42 GOAL - Jason Price:Carlisle 2 - 2 Port Vale Jason Price finds the net with a goal from inside the area to the bottom right corner of the goal. Carlisle 2-2 Port Vale. 80:09 Matthew Robson produces a cross, blocked by Sean Rigg. 78:32 Matthew Robson sends in a cross. The referee blows for offside against Jason Price. Indirect free kick taken by Chris Martin. 78:32 Substitution Jemal Johnson leaves the field to be replaced by Justin Richards. 75:47 Matthew Robson fouled by Jemal Johnson, the ref awards a free kick. Assist on the goal came from James Berrett. 75:47 GOAL - James Chester:Carlisle 1 - 2 Port Vale James Chester finds the net with a headed goal from inside the area. Carlisle 1-2 Port Vale. 74:06 Kevan Hurst delivers the ball. 73:29 Robert Taylor sends in a cross. 72:35 The ball is crossed by Adam Yates, Headed from the edge of the area by Robert Taylor goes wide of the left-hand upright. Centre by Matthew Robson. 72:25 Kris Taylor produces a cross, Sean McDaid manages to make a clearance. 72:10 The ball is delivered by Kris Taylor. 71:25 The ball is crossed by Tom Taiwo. 70:14 The official flags Sean Rigg offside. Indirect free kick taken by Adam Collin. 70:03 The ball is crossed by Kris Taylor, James Chester manages to make a clearance. 69:36 The ball is sent over by Kris Taylor, Peter Murphy makes a clearance. 68:53 Jason Price challenges Chris Martin unfairly and gives away a free kick. Chris Martin restarts play with the free kick. 68:18 Kevan Hurst crosses the ball, Lee Collins makes a clearance. Corner taken right-footed by James Chester, Chris Martin makes a save. 67:36 The ball is crossed by Kevan Hurst, blocked by Kris Taylor. 66:24 Sean McDaid crosses the ball, Louis Dodds manages to make a clearance. 65:55 Matthew Robson delivers the ball, Robert Taylor manages to make a clearance. 64:34 Sean McDaid concedes a free kick for a foul on Marc Richards. Jemal Johnson produces a cross, Lee Collins takes a shot. Save by Adam Collin. 63:12 Robert Taylor provided the assist for the goal. 63:12 GOAL - Marc Richards:Carlisle 0 - 2 Port Vale Marc Richards grabs a headed goal from deep inside the penalty area. 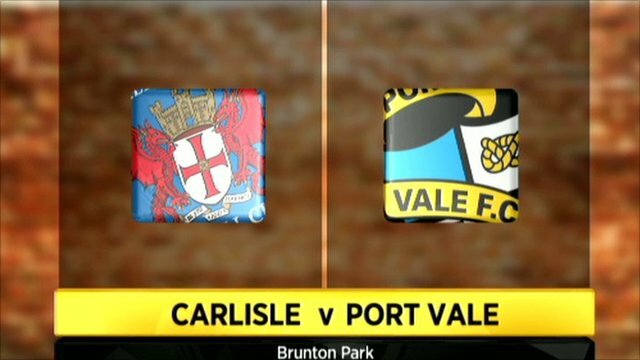 Carlisle 0-2 Port Vale. 61:54 Frank Simek produces a cross, Headed effort from deep inside the penalty area by Kevan Hurst misses to the right of the target. 61:10 Outswinging corner taken right-footed by Jemal Johnson from the right by-line, Peter Murphy manages to make a clearance. 60:12 The ball is crossed by Matthew Robson, save by Chris Martin. 59:11 Jemal Johnson challenges Sean McDaid unfairly and gives away a free kick. Direct free kick taken by Adam Collin. 58:40 The ball is crossed by Jemal Johnson, Robert Taylor has an effort at goal from 18 yards. Save made by Adam Collin. 57:24 The referee penalises Sean Rigg for handball. Chris Martin takes the free kick. 57:24 Substitution Oliver Norwood goes off and Kevan Hurst comes on. 57:24 Substitution Jason Price comes on in place of Gary Madine. 57:24 Substitution (Carlisle) makes a substitution, with Matthew Robson coming on for Ben Marshall. 56:37 Frank Simek sends in a cross, Chris Martin makes a comfortable save. 55:17 James Berrett takes a shot. Chris Martin makes a save. 52:41 The ball is sent over by Tom Taiwo, Adam Yates makes a clearance. 52:10 The referee blows for offside. Chris Martin takes the indirect free kick. 51:46 Unfair challenge on James Chester by Louis Dodds results in a free kick. Free kick taken by James Chester. 49:53 Foul by James Chester on Robert Taylor, free kick awarded. Direct free kick taken by Kris Taylor, Craig Curran sends in a cross, save by Chris Martin. 49:53 Booking James Chester is given a yellow card. 48:45 A cross is delivered by Robert Taylor, clearance made by James Chester. 48:11 The ball is sent over by Kris Taylor, clearance made by James Chester. 45:25 Robert Taylor produces a cross. 45:18 Marc Richards crosses the ball, clearance by Peter Murphy. 45:00+1:34 The half-time whistle blows. 44:53 Kris Taylor gives away a free kick for an unfair challenge on Craig Curran. Direct effort from the free kick comes in from Peter Murphy, Chris Martin makes a save. Outswinging corner taken right-footed by Sean McDaid from the right by-line to the near post. 43:49 Outswinging corner taken by Oliver Norwood, Header on goal by James Chester from inside the box goes harmlessly over the target. 41:18 GOAL - Oliver Norwood:Carlisle 0 - 1 Port Vale Own goal by Oliver Norwood. Carlisle 0-1 Port Vale. 41:07 The ball is delivered by Kris Taylor, Frank Simek manages to make a clearance. 40:03 The referee penalises Craig Curran for handball. Indirect free kick taken by Chris Martin. 39:39 Oliver Norwood produces a cross. 38:44 Kris Taylor is flagged offside by the assistant referee. Free kick taken by Adam Collin. 38:21 The ball is swung over by Adam Yates, clearance by Peter Murphy. 37:54 Sean Rigg fouled by Oliver Norwood, the ref awards a free kick. Chris Martin takes the free kick. 37:00 Shot from 25 yards from Ben Marshall. Chris Martin makes a save. Inswinging corner taken by James Chester. 36:37 Centre by Ben Marshall. 36:14 Gary Madine takes a shot. Kris Taylor gets a block in. 35:51 Sean Rigg challenges James Chester unfairly and gives away a free kick. Adam Collin takes the direct free kick. 34:39 The ball is delivered by Frank Simek, clearance by Adam Yates. 32:25 The ball is delivered by Robert Taylor. 31:59 Ben Marshall takes a shot. Chris Martin makes a save. 29:57 Kris Taylor crosses the ball. 27:56 Peter Murphy challenges Marc Richards unfairly and gives away a free kick. Ritchie Sutton takes the direct free kick. 25:16 Effort from the edge of the box by Frank Simek goes wide of the right-hand upright. 23:34 James Berrett has an effort at goal from outside the area missing to the wide left of the goal. 23:18 The ball is sent over by Frank Simek, clearance by Adam Yates. 22:43 The ball is delivered by James Chester, Lee Collins manages to make a clearance. 21:10 James Berrett has an effort at goal from outside the penalty box missing to the wide left of the goal. 19:40 James Chester gives away a free kick for an unfair challenge on Sean Rigg. Jemal Johnson crosses the ball from the free kick left-footed from left wing, save by Adam Collin. 19:25 Marc Richards produces a cross, Peter Murphy manages to make a clearance. 17:11 Doug Loft challenges Tom Taiwo unfairly and gives away a free kick. Direct free kick taken by Frank Simek. 16:49 Oliver Norwood fouled by Marc Richards, the ref awards a free kick. Peter Murphy restarts play with the free kick. 15:51 Tom Taiwo crosses the ball, Adam Yates makes a clearance. The ball is sent over by Oliver Norwood, Headed effort from inside the area by James Chester misses to the left of the goal. 15:01 James Berrett crosses the ball. 14:30 Jemal Johnson produces a cross, save by Adam Collin. 14:11 Outswinging corner taken from the left by-line by Robert Taylor, Peter Murphy manages to make a clearance. 13:56 Jemal Johnson produces a drilled left-footed shot from outside the penalty box and hits the bar. 13:42 The ball is sent over by Kris Taylor. 7:40 A cross is delivered by Kris Taylor. 7:11 Marc Richards fouled by James Chester, the ref awards a free kick. The free kick is delivered left-footed by Robert Taylor from left wing. 6:27 Tom Taiwo fouled by Louis Dodds, the ref awards a free kick. James Chester takes the direct free kick. 5:18 Jemal Johnson takes a outswinging corner from the right by-line to the near post. 3:26 Unfair challenge on James Chester by Lee Collins results in a free kick. Sean McDaid restarts play with the free kick. 3:13 Centre by Kris Taylor, clearance made by James Chester. 2:10 Sean Rigg is penalised for a handball. Oliver Norwood takes the free kick. Shot by Ben Marshall from outside the box goes over the net. 1:07 Effort on goal by Ben Marshall from just inside the penalty area goes over the target.